Embark on a flight that encompasses all the spectacular sites of the red center, viewing Uluru, Kata Tjuta, Lake Amadeus and Kings Canyon. 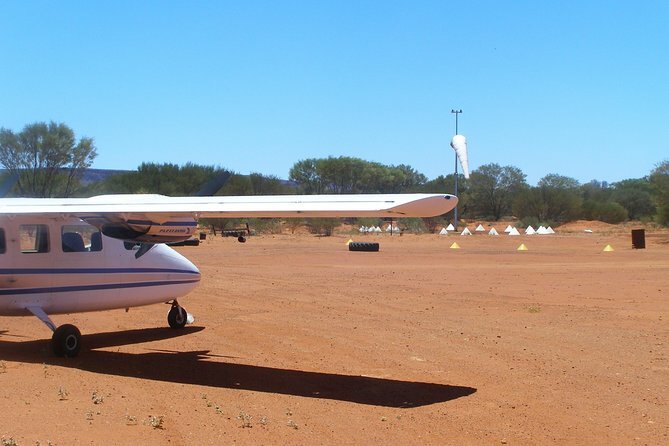 This tour includes a landing at Kings Creek Station, an authentic country airstrip. Enjoy the drive along the George Gill ranges to Kings Canyon for a one-hour walk. Enjoy guaranteed window seats on all flights. Your professional pilot will provide you expert commentary along the way. Departing from Ayers Rock airport, your tour begins flying over the northern and western faces of Uluru (Ayers Rock) and Kata Tjuta (The Olgas). Continue over the remains of an ancient coral reef on the way to Lake Amadeus, before the pilot descends down to conduct a low level pass following the inlet into the lake. Witness the incredible patterns on the surface of the lake and the beautiful colors that make this one of the most breathtaking views in the area. Climb up and take in the 112-miles (180-kilometers) of the lake and its patterns. Enjoy the flight across the Australian outback and gain an appreciation of its vastness. As you approach the George Gill Range and the opening of Kings Canyon, your pilot will conduct more orbits overhead the Canyon, pointing out the Lost City along the Canyon edge and the Garden of Eden waterhole located inside the Canyon. Once your aerial view of Kings Canyon is complete, follow the George Gill ranges to land at Kings Creek Station, which is a working camel station in outback Australia. Here you will be able to visit the station house and get up close with some of their friendly camels. There is also time to purchase lunch or snacks from the station house. Follow Kings Creek and the Ghost Gums along the creek bed walk through the incredible Kings Canyon, be sure to keep an eye out for some of Australia's most iconic wildlife. Once you return from Kings Canyon to the airstrip, you will fly over the magnificent eastern end of Lake Amadeus which features some of its most vibrant colors. Your local pilot knows all about Uluru and its surroundings and will provide you with expert commentary, so please feel free to ask as many questions as you like. Experience a view like no other!